After another weekend full of lots of dinning out, I was so happy to just make breakfast for my husband and I this morning! Having company is great, but it can be exhausting and my poor tummy needs a serious break from it 😦 Portland has some great places to eat and drink, but personally, I don’t prefer to eat out multiple times in a row! This morning deserved a healthy, yet holiday worthy meal. 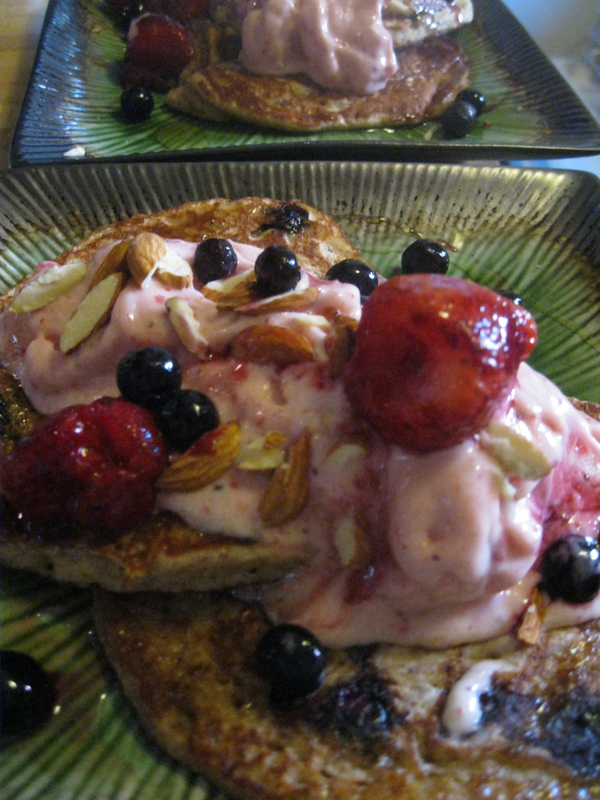 I topped blueberry pancakes with strawberry-banana “ice cream”, more berries, almonds, and a light drizzle of agave nectar. Directions: Heat skillet over medium heat. Coat with nonstick spray or coconut oil. Combine dry ingredients. 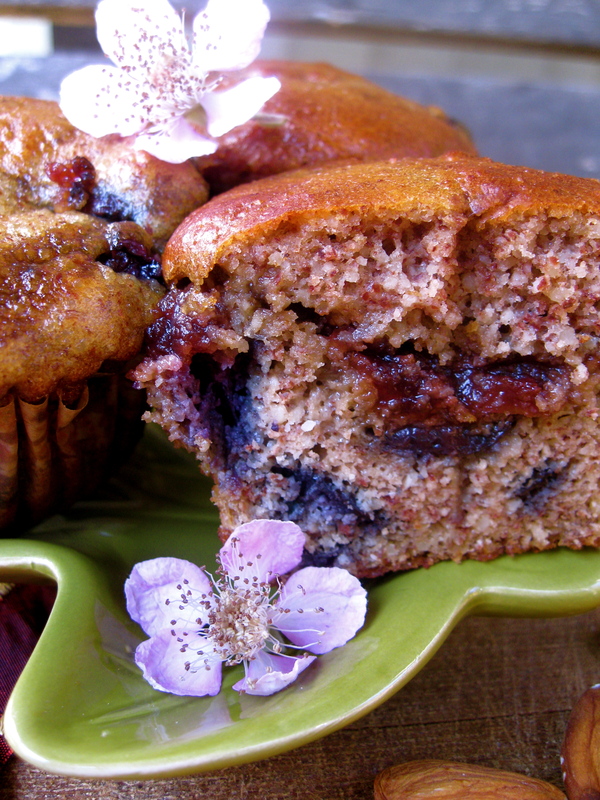 Combine wet ingredients, leaving out the blueberries, and whisk into dry. Pour about 1/3 cup batter onto the skillet and top with blueberries. Makes 4, serves 2. *dash of agave (optional, may be necessary if bananas are under ripe. 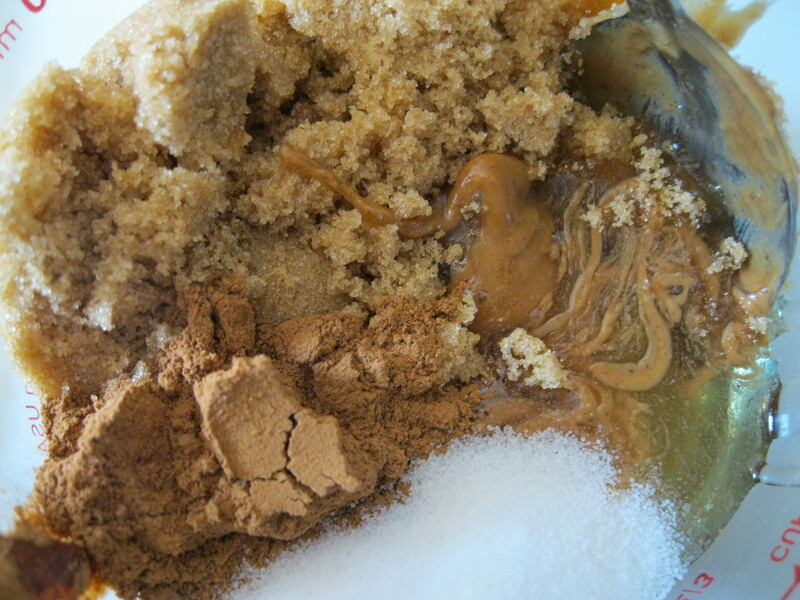 Combine all ingredients in food processor and process until smooth and creamy. 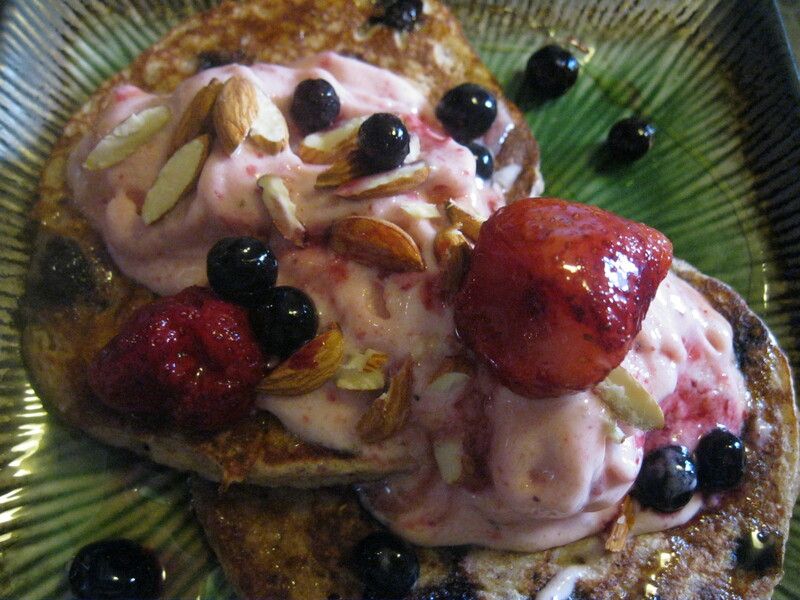 Top pancakes with “ice cream,” additional berries, and sliced almonds. Drizzle with agave if you’re feeling extra fancy. BAM! I hope all you Americans are having a good Fourth! Tonight we are making vegetable pizzas on the grill for the first time. Hope they turn out! Confession: I am a granola addict. I make it every week, and when I was in India last January, it was the number one food I missed. I know, I know, the internet is full of granola recipes, but I have tried many styles and I think this way is really special! What I love about it most, besides the great flavor, is its amazing versatility. The ingredients are highly customizable to what you have on hand or prefer and it can be used to make chewy granola bars, crunchy granola bars, or crunchy loose granola. What more could you ask for? I am such a granola enthusiast that I actually like to divide the batch in half and do one pan of chewy granola bars for taking to school as snacks and one pan of crunchy crumbles to top my oatmeal with. 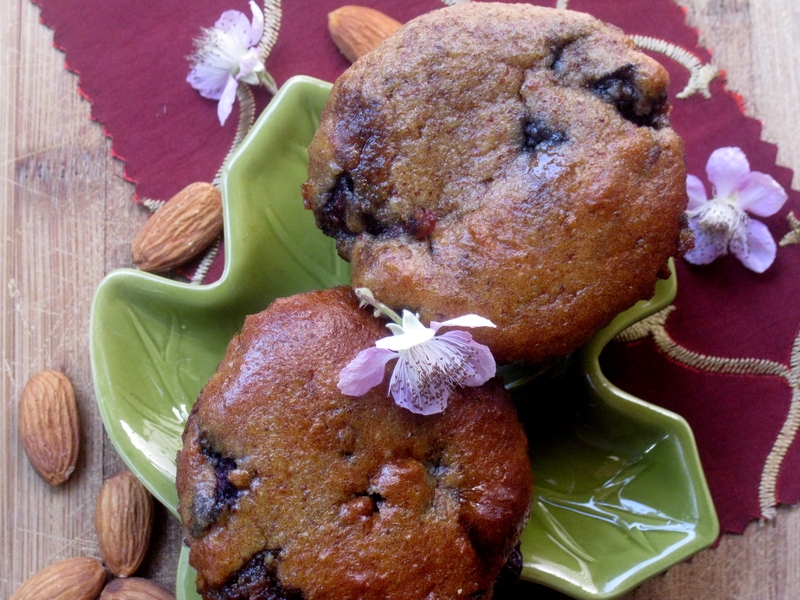 Here is the general recipe, feel free to substitute your favorite nuts, seeds, and dried fruits. 1/4 cup sesame, sunflower seeds, or pepitas. Preheat oven to 350 degrees F. Combine oats and nuts (not seeds or coconut yet) on a baking sheet and toast about 10 minutes, until just barely beginning to become fragrant. Add the seeds and coconut and continue roasting about 5 minutes longer, until everything is a light golden brown and smells fragrant. Meanwhile, chop the dried fruit if necessary and combine the wet ingredients, either in a small sauce pan or in a microwave safe glass container, such as Pyrex. The saucepan method is more accurate, because you don’t want to burn this mixture, but the microwave is a safe bet as long as you check it frequently. 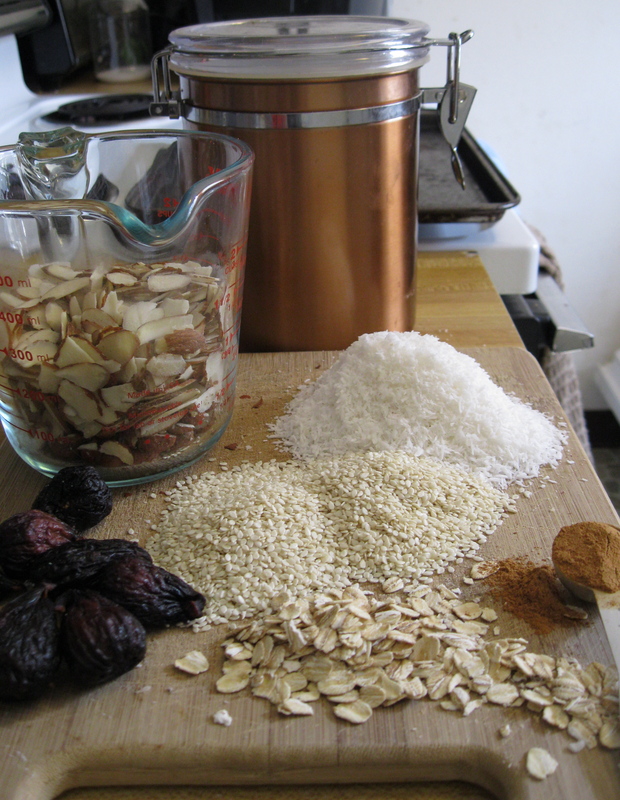 When all ingredients are toasted, transfer them to a large bowl and add the puffed rice and the dried fruit. Stir to combine. Heat the wet mixture, either over medium- low heat on the stove, or in 30 second intervals in the microwave until the sugar is dissolved. Careful not to boil or burn it! A little bubbling is okay, but too much and it will dry rock hard. I like a caramel-like consistency, especially for the chewy bars. Now you have to decide what kind of granola you want! Line a baking dish with parchment paper or coat in with cooking spray and turn the mixture out onto it. Wet hands with cold water and press the mixture down until the granola is packed and even. Stick them in the freezer or refrigerator- they can be sliced once they have cooled. They will store well in the fridge for at least two weeks, at least up to a month in the freezer. I have never had them last longer than that in this house! Follow the above directions, except instead of sticking them in the freezer, put them back in the over for about 15-20 minutes longer. Spray a pan with cooking spray and pour the granola on. Bake 15-20 minutes, stirring once or twice. 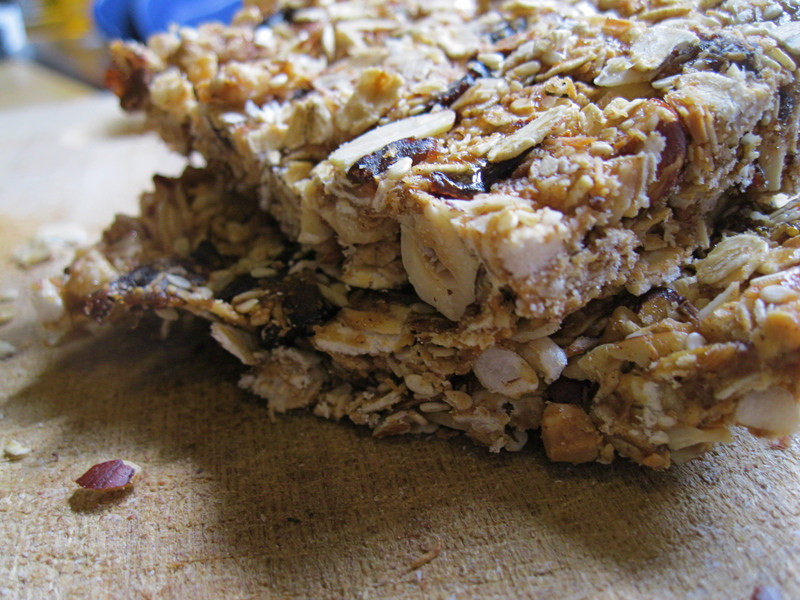 Alternately, make crunchy granola bars and just crumble half and for cereal use. 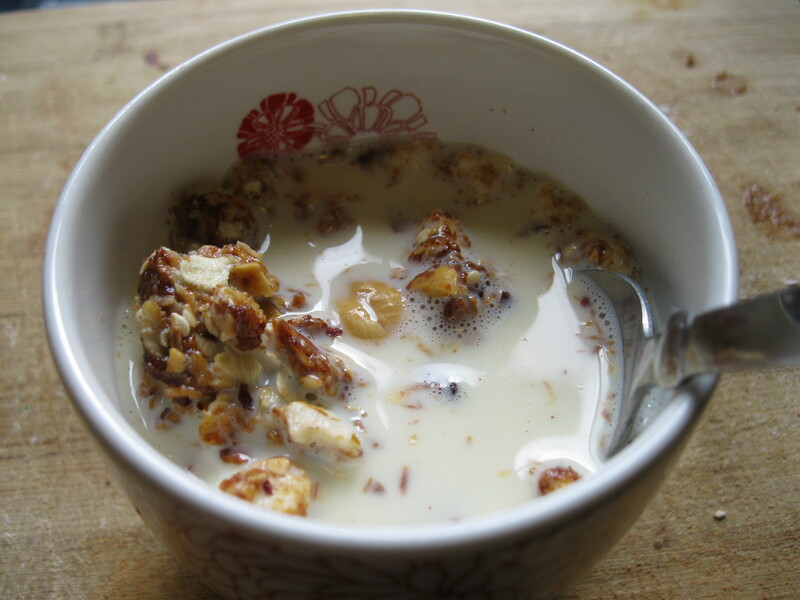 What is your favorite way to enjoy granola?